Posted on Tue, Feb 7, 2012 : 10:05 a.m.
Cowboys Stadium in Arlington, Texas. Six months before the Michigan football team opens the 2012 season, and its first game is on its way to being a sell out. All 25,000 tickets the University of Michigan had to sell for the Sept. 1 Michigan vs. Alabama game at Cowboys Stadium in Texas are gone, according to a release issued Tuesday morning. 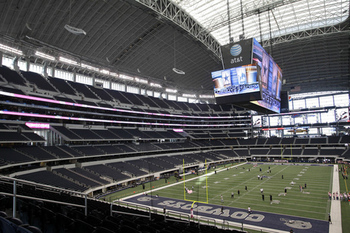 All 25,000 to the Cowboys Classic were sold to donors and season ticket holders before a public sale could begin. The public sale was scheduled to start Feb. 29. Ticket prices ranged from $125 to $285. The university said it may receive standing-room only tickets to sell in April, and those would be offered first to Victors Clubs members, then Michigan football season ticket holders and then the general public. The Michigan-Alabama matchup is the fourth Cowboys Classic. LSU beat Oregon, 40-27, in front of a crowd of 87,711, in the 2011 edition. Thu, Feb 9, 2012 : 6:25 a.m.
Thu, Feb 9, 2012 : 3:38 a.m.
Thu, Feb 9, 2012 : 3:37 a.m.
&quot;My mama told life is like a box of chocolate, you never know what you gonna get&quot; Remember that Tide man, haha I like your prediction D21, but do we have to give up so many points? Wed, Feb 8, 2012 : 10:51 p.m. Roll Tide, Michigan 26 Bama 24 Sorry, there's no Forrest Gump around to save Tide's neck. GO BLUE! Wed, Feb 8, 2012 : 11:43 a.m.
Sun, Feb 12, 2012 : 9:40 a.m.
Troll Tide!!!! Lol, no hate, just thought it was a clever come back. Congrats on a good season. Agreed, I can't hate like you like I can hate a Buck. Wed, Feb 8, 2012 : 10:55 p.m. Roll Tide!!! Very chipper. I want to be sarcastic buy I can't. I just can't hate a Bama guy like I can Ohio. Tue, Feb 7, 2012 : 9:48 p.m.
you have to play the big boys and beat the big boys to be a national/elite/power house. its great that Michigan is playing Alabama. Now we have to go down there and beat them. That will make us nationally relevant again. Tue, Feb 7, 2012 : 9:30 p.m. The Big House would be a morgue without the student section. They may not pay as much for their season tickets and they can't yet be big donors, but they make a lot of noise and they give Michigan Stadium personality. It's unfortunate that there was no effort made to release, perhaps by lottery, at least a couple thousand tickets for students to purchase. Tue, Feb 7, 2012 : 11:05 p.m.
You mean the embarassment in the NW corner of the stadium that is sparcely populated even as 110+K attendance figures (lies) are announced? Tue, Feb 7, 2012 : 5:15 p.m. While this is clearly a high profile game given who we're playing, the national exposure, etc, I hope David Brandon pays attention and starts scheduling more teams with panache, rather than more App State and UMass games, and doesn't continue to hope that UM will be the MAC champion. Tue, Feb 7, 2012 : 5:39 p.m.
he won't do that because then UM will have another 1 or 2 losses every year. Tue, Feb 7, 2012 : 4:22 p.m.
Glad to read about the high demand for tickets to this game. Lots of intrigue about this game. Questions on how good will Alabama be? How good will Michigan be? Good luck to all who knows these answers already. Tue, Feb 7, 2012 : 3:59 p.m. I'm just happy that certain Michigan players will get exposed to real football. Alabama is a high water mark of toughness and physicality. there is no better teacher than failure. I think Michigan's defense will do pretty well. But our lack of size and nastiness up front on offense will expose us. I like the direction our team is headed, but we still have a year or so of taking out rich rod's trash. Sun, Feb 12, 2012 : 9:39 a.m.
Yeah 11-2 and we had 8 home games. Pointing out Michigan's weaknesses and stating that Michigan has a year or two to really make it over the hump is not an insult to what they did, but just and educated observation. It is true, Michigan is on its way to being one of the top teams, but they aren't there yet. That was apparent with the road loss to Iowa and MSU. Michigan will do it. Fri, Feb 10, 2012 : 11:49 p.m.
You do realize that we were 11-2 this year right? Tue, Feb 7, 2012 : 3:57 p.m.
At last, Michigan is back where they belong, playing the big dogs. Whether they win the Big 10 in 2012 is a moot point at this point because Michigan back on top of the Big 10 is inevitable in the near future but Mich. regaining their place among the elite in college ball in my opinion starts with that Alabama game win or lose. Go Blue ! Tue, Feb 7, 2012 : 3:34 p.m.
For all the Sparty trolls out there, THIS is why we got to go to the Sugar Bowl. Well, that and we were actually eligible. Tue, Feb 7, 2012 : 3:44 p.m. The game that U of M didn't sell its ticket allotment for? Not a sparty troll, but you are making an argument for Sparty, that it wasn't your team but it was your reputation and a bowl system that only cares about money that got you in the game. That is why the B1G title game is a bigger deal, you have to earn your way into it. Not just have a big fan base, so you get invited to the &quot;Cowboy Classic.&quot; Too bad you were not able to schedule a home and home series with Alabama, like Penn St. and Michigan St. The offensive line better get ready for VA-Tech to the fourth power or this game will be over by halftime. Sun, Feb 12, 2012 : 9:35 a.m.
Scott: Bama does not lose their QB, just an FYI. I believe he will be a Junior possibly just a Sophomore. And as for them graduating a large amount of guys on their D-Line....well they have several guys that are just as good. There three biggest losses are at LB, RB and Safety. But, they have guys to step in and fill those shoes. It is going to be a very very tough game for Michigan. I hope D-Rob's passing game gets much better between now and this game. That is Michigan's only shot is to be able to be balanced on the Offensive side of the ball. I think defensively Michigan can hold its own against Bama's offense. Fortunately Bama loses their QB and a bunch of their D lineman. Thank the football gods. That 2011 team was nasty. Tue, Feb 7, 2012 : 5:13 p.m.
You don't get better unless you play the best. And right now, Bama is THE BEST. Tue, Feb 7, 2012 : 4:35 p.m. I agree, and hey, if we lose a close game to them and both of us win out the rest of the season don't we deserve a rematch in the NC game? That is exactly what happened this year, correct? I'd love a win for sure, but even a loss, as long as it isn't demoralizing, will be good for the following road games. Tue, Feb 7, 2012 : 3:26 p.m. True, but I'd gladly trade this for any worthless game against a cupcake.